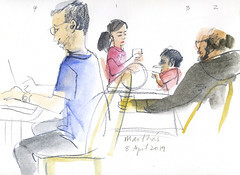 Although neighborhoods like Bayview, Bernal Heights, and Glen Park are considered to be among the more affordable in the city, they have all seen tremendous appreciation over the past two years. Back in April 2013, the median price for a Bayview house was just $447,000. It grew by 7.4 percent to hit $480,000 in 2014 and then soared 31.2 percent to its current $630,000. 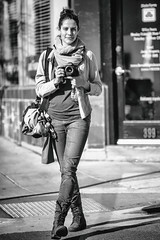 Bernal, of course, has been widely talked about as a hot neighborhood, and its prices reflect that reputation. 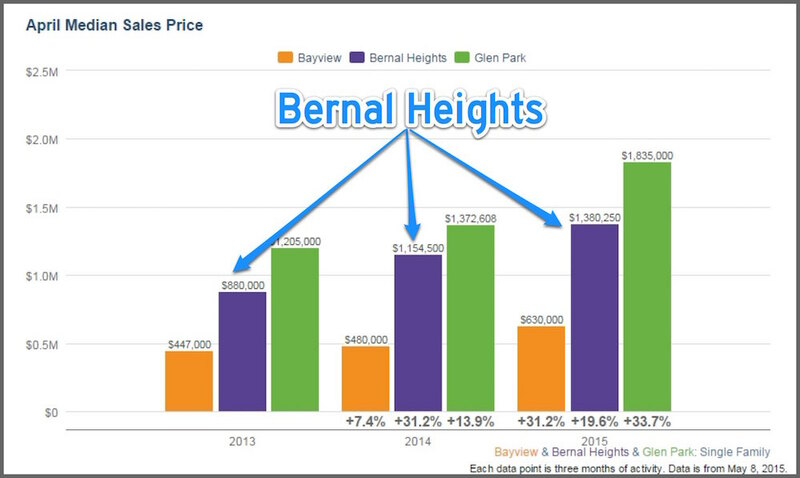 In April 2013, you could get a median Bernal home for just $880,000. That number grew by 31.2 percent to $1.154 million in 2014 and has now grown another 19.6 percent to hit $1.38 million this year. Glen Park has seen similar trends, growing from $1.205 million in 2013 to $1.835 million now. As always, low inventory is part of the issue in San Francisco. New listings this spring barely topped 600 per month, compared with about 700 per month last year and 800 two years ago. And while 3,454 new-construction housing units were completed in 2014, the most in the past 20 years according to Paragon’s tally of Planning Department figures, it still isn’t enough in a city where the economy is booming and new residents are flooding into town. 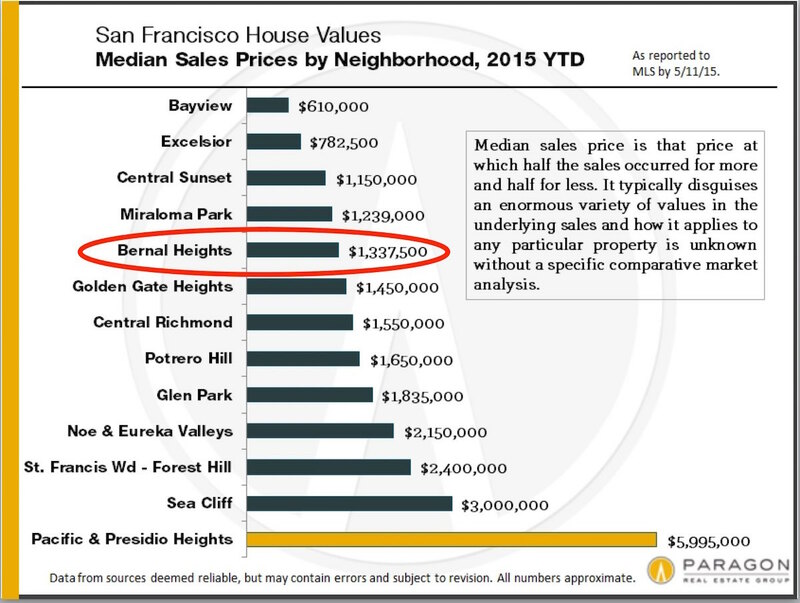 Bernal seems to have had a particularly low number of listings of late. 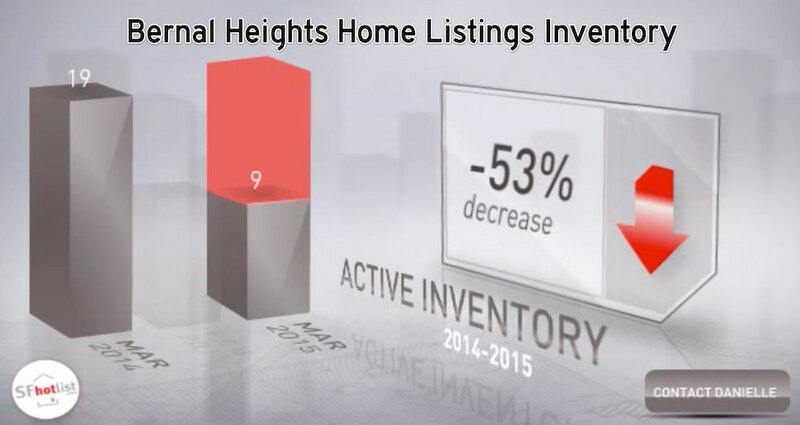 According to this March 2015 summary by realtor and neighbor Danielle Lazier, there were just 9 properties listed for sale in Bernal in March, which represented a 53% decrease from the year before. 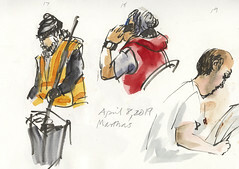 And when houses do come on the market in Bernal, they tend to sell with neck-straining quickness. Neighbor Danielle’s data says that in March, Bernal homes sold after an average of just 15 days on the market, or 50% faster than a year before. Given the small number of data points, I’m skeptical that this number means much. Zillow guesses my apartment is worth about 25% more than it was in 2013. That number seems more in line with reality (though I still take it with a grain of salt). It’s just anecdata, but 25-30% seems in line with the prices I saw home shopping in Bernal (and elsewhere) in 2013 vs. the prices I see now. Interesting. Mine is up 110% since 2013. Your property value has more than doubled in 2 years? Wow. I had no idea. If only Shelly Trew had sent me a newsletter about this. In all fairness, Shelly’s a very intimidating looking guy. He’s like, what, 6’9″ and hulked up like Dwayne the Rock Johnson, with Danny Trejo style tattoos snaking up and down his neck? Yeah I am with you: no way would I try to confront him if he parks his car in front of my garage.